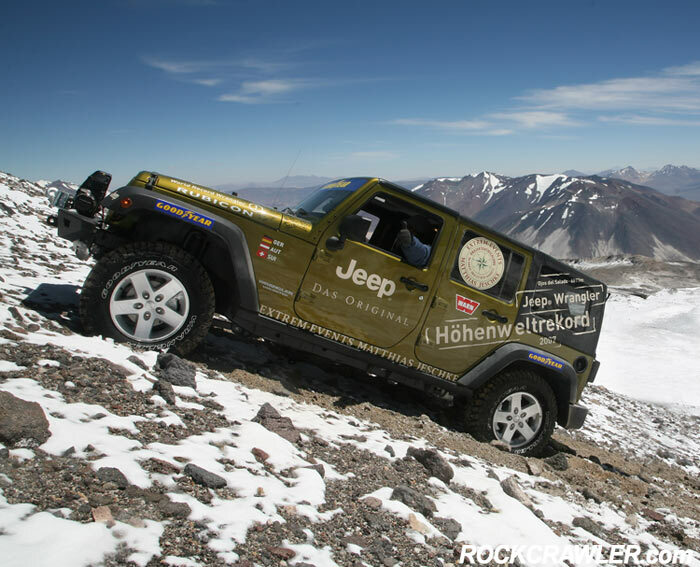 Auburn Hills, MI - Seventy years after the first man climbed the world’s highest volcano, Ojos del Salado in Chile, two Jeep® Wrangler Unlimited vehicles set a new world record by climbing 6,646 meters (21,804 feet) to the volcano’s rim. The achievement, certified by Guinness World Records™, is not one that is likely to be easily beaten. Others tried, but only the “go anywhere, do anything” Jeep vehicles could make it to the top of the volcano. It is the second highest mountain in the Western Hemisphere (6,892 meters / 22,597 feet), and now dubbed the “highest parking lot in the world”. Jeep parking only, of course. 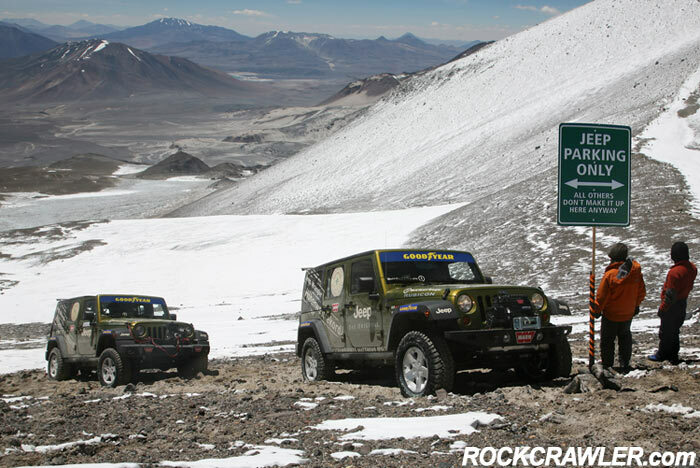 Over five exhausting days in March, the Jeep Wrangler Unlimited vehicles carried a team from Extrem Events (Germany), led by Mattias Jeschke, from the base of the inhospitable volcano in the Chilean Andes to the highest point that a four-wheeled vehicle has traveled. “This was exactly the challenge to separate the new Jeep Wrangler Unlimited from all other 4x4 vehicles. A climb like this in not just off-road, but extreme conditions, is a testament to the performance of the vehicle’s powertrain, suspension and overall quality. We are very proud that Wrangler Unlimited was the first vehicle to be able to complete such a rigorous challenge, and believe that it really does set the vehicle apart from its competition,” said George Murphy, Chrysler Group Senior Vice President of Global Marketing. During the trip, the team endured hurricane-strength winds, temperatures that reached minus 30 degrees Centigrade (minus 22 degrees Fahrenheit) and the thin air of such high altitudes, as it maneuvered over malicious glaciers, fissured rock cliffs and volcanic sand. The last stretch of the climb was the most grueling. Both Wrangler Unlimited vehicles had to cross a glacier, parts of which were so smooth that any travel by foot required spiked shoes. At the far end was the glacier field, a fissured ice area strewn with razor sharp snow penitents. It was here that the vehicle’s 3.8L V-6 engine and Goodyear’s MT/R tires proved their true capability, and made the Jeep Wrangler Unlimited the first vehicle to ever cross the Ojos del Salado glacier. 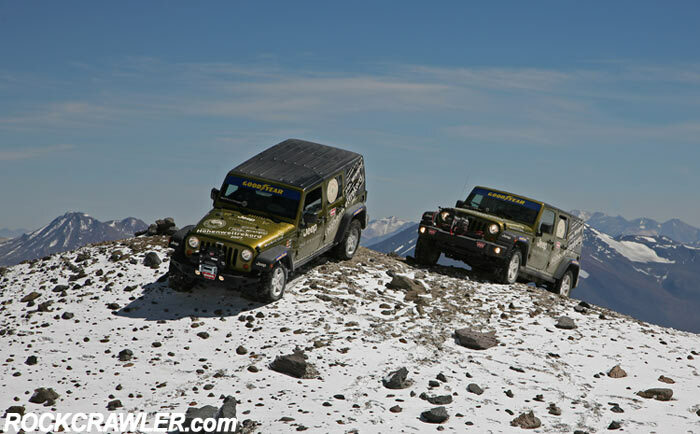 The two Wrangler Unlimited vehicles that completed this challenge were standard equipment Rubicon models. In addition to the standard equipment, both vehicles were fitted with Goodyear MT/R tires, electronic altitude measuring technology and winches. Featuring a one-of-a-kind, four-door open-air design, the all-new Jeep Wrangler Unlimited offers even more comfort, space, versatility and open-air options than the all-new Wrangler. With room for five adult passengers – a Wrangler first – and the most cargo space ever offered in a Wrangler, the Wrangler Unlimited combines class-leading off-road capability with everyday practicality. The Jeep Wrangler Unlimited expands the Jeep experience and core values to a broader range of customers who have always wanted a Wrangler, but also needed more space and versatility. Outside North America, two engine options are available, an all-new 2.8-litre common-rail turbo diesel engine as well as a new 3.8-litre V-6 petrol engine. The Wrangler is available in both left- and right-hand drive. With solid axles, removable doors, exposed hinges, a fold-down windscreen and innovative removable and convertible tops, Wrangler retains the brand’s coveted core values of freedom, adventure, mastery and authenticity.